You’ve landed the job, but the next hurtle is negotiating a salary. While every employee wants the most money possible, you need to consider several factors before choosing a number. By doing simple research and agreeing to be flexible, you can get a salary that works for both parties. The following are just a few tips for how to negotiate a salary at your new job. Take the time to research the position along with the city you’re in. There will be information on average salary level, beginning salary level, and professional salary level. If you’re new to the field, the beginning level will be where you’ll want to start. If you have several years experience, you can aim for somewhere between average and the higher rate. Salary isn’t just about money, benefits can be an important part of your salary package. Regardless of what you want in your salary package, you need to know ahead of time what you’ll like to have and what you’re willing to accept. It’s unprofessional to enter into a negotiation and not know what you want. What are you worth to a company? Do you have several years of experience? Are you exceptional at what you do? You need to consider what you bring to the table, but at the same time you shouldn’t be arrogant. In this economy, you should actually be thankful to be offered the job and remember that while you are a good fit and have a lot to offer, most companies aren’t able to pay as much as they were. You never want to be the first one to bring up your salary. Doing so will make it appear as though your only concern is being paid. Instead you want to appear as though you truly care about your position with the company. At the same time, you should never being work without knowing how much you’ll be paid. You may think you’re worth quite a bit, but you have to reasonable and flexible when negotiating your salary. This means you should give yourself some breathing room, but never start so high that the employer will be turned off by your request. 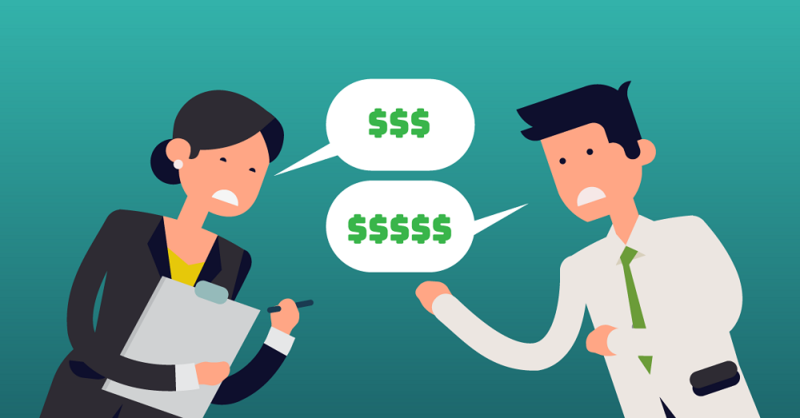 Negotiating the salary for a new job can take several meetings with an employer. However, doing your research and knowing exactly what you want can help speed things up. You also need to make sure to be flexible and reasonable, while still keeping your value in mind.